The All Terrain Scout Transport (AT-ST), also called the chicken walker because of its two leg design walking motion, is a all terrain vehicle used by the Grand Empires Army. 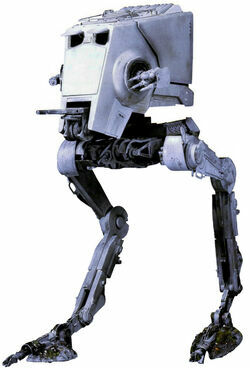 The AT-ST was designed to be a recon hit and run vehicle and a scout vehicle. It was lighter than its predecessor, the AT-AT. It was a major vehicle used in the Battle of Endor. The typical arsenal is light cannons and grenade launchers. Since the vehicle is so light it is a very good vehicle for scouts and moves at a relatively fast speed, and has sufficent firepower for such a loght vehicle.